There are many factors serving to drive the global fuel management systems market. The need to check fuel pilferage and bring transparency in fuel consumption are some of them. This is because fuel accounts for most of the operating cost in transportation. An effective fuel management system (FMS) helps to tackle challenges posed by higher or fluctuating prices of oil used as fuel and also difficulties cropping from stringent regulations pertaining to environment by effective management of fuel. It does so by monitoring, controlling, and reporting fuel consumption. This unique perceived benefit has driven up the demand for fuel management system (FMS). A report by Transparency Market Research projects the global market for to register a lackluster 4.3% CAGR during the period between 2017 and 2025 to become worth US$9.95 bn by 2025 from US$6.85 bn in 2016. Depending upon end-use, the market can be divided into railway, road, marine, and aircraft. Of them, the segment of marine transportation accounts for most of the demand in the market. Railways are least polluting mode of transport and it is one of the biggest reasons for growth in this sector. Besides, emergence of technologically advanced fuel management systems for locomotives is also providing a boost to the market. The different types of processing deployed in the market are measuring, monitoring, and controlling, among others. Measuring, for example, includes bunker delivery note (BDN) which is the amount of fuel bunkered, tank sounding, which is a system for measurement of the amount of fuel inside the tank, and fuel flow meters, which measures fuel supplied to engines, generators, and boilers. Controlling FMS systems are specific, automated devices/equipment installed in the fleet, which maintain desired specifications at all times of their operations. Controlling helps tackle the rising cost of fuel, as it reports and controls the fuel consumption and increases the operational efficiency. Based on application, the global fuel management system (FMS) market can be segmented into fuel consumption, efficiency level, fleet management, viscosity control, and others. 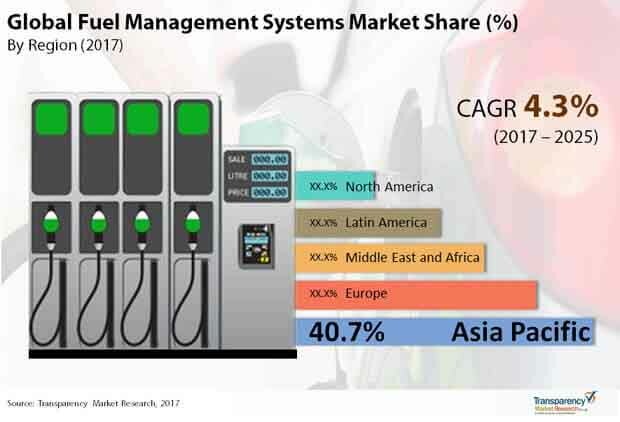 From a geographical standpoint, Asia Pacific dominates the global fuel management systems (FMS) market with maximum share. The region is also expected to outpace all others in terms of growth rate by registering a CAGR of 4.6% in the forecast period and thereby grow its dominant share to 41.8% by 2025. This is because of the rapid industrialization and urbanization leading to considerable investment in navigation automation, fuel management systems, dynamic positioning of vessels, ballast water management, fuel consumption meters, and density and viscosity meters. Europe trails Asia Pacific in terms of market share in the global fuel management systems (FMS) market. Since most countries in Europe are connected well with railways and roadways, demand for new fuel management systems and upgrade of existing systems is expected to be high. The market in North America is a mature one and is predicted to see lacklustre growth as the region mostly complies with the new regulations and standards for environment protection. Two important developments benefitting the market in the region is cross fleet standardization for bigger units that carry commodities, cargo, and oil and gas products and fuel theft detection, which is rampant in the region. Omnitracs, LLC, E-Drive Technology, The Veeder-Root Company, ESI Total Fuel Management, SCI Distribution, LLC, Fluid Management Technology Pty Ltd., SmartFlow Technologies, Emerson, Guduza System Technologies, Fleetmatics Group PLC, Telenav, Inc., TomTom International BV, and Trimble Inc. are to name a few key players in the global fuel management systems (FMS) market. Fuel cost accounts for a major portion of the transportation operating cost. Higher prices/fluctuating prices of fuel oil and strict environmental norms have led to the need for efficient management of fuel. Thus, monitoring, controlling, and reporting of fuel consumption is of key importance along with the management of fleet in order to control the total operating cost of a vessel. Railways and waterways are essentially inexpensive modes of goods/cargo/passenger movement. Operational cost is about 45% less as compared to roadways and about 70% less than air transportation. By waterways, a large bulk can be transported in one go. Demand for merchant vessels is thus high for movement and transportation of goods, cargo, and oil and gas. Regional, national, and international trades flourish with the increase in advancements in the transportation industry. Enforcement of emission control areas (ECAs) is anticipated to augment the demand for middle distillate oils (MDOs and MGOs). Stringent regulations and mandates levied on the shipping industry for curbing operation cost and emission control have led to more technological developments and advancement in building efficient fuel management systems to control the overall costs. Technologies in fleet management and fuel consumption (monitoring, control, and reporting) are largely available along with viscosity control of the fuel. Secondary research sources which were typically referred to, but are not limited to, include: company websites, annual reports, financial reports, internal and external proprietary databases as well as relevant patent and regulatory database, national government documents, market reports, news articles, press releases, industry magazines, webcasts specific to companies operating in the market, and regulatory databases such as Factiva and Bloomberg, national government documents, statistical databases, and webcasts specific to companies operating in the Fuel Management Systems (FMS) market. We conduct primary interviews on an ongoing basis with mining industry participants and commentators to validate data and analysis. Primary and secondary research were conducted to understand and arrive at trends, which were employed to carry out forecasts for the Fuel Management Systems (FMS) market. These help validate and strengthen secondary research findings. These also help develop the analysis, team’s expertise and market understanding. Key major players operating in the Fuel Management Systems (FMS) market include Omnitracs, LLC, E-Drive Technology, The Veeder-Root Company, ESI Total Fuel Management, SCI Distribution, LLC, Fluid Management Technology Pty Ltd., SmartFlow Technologies, Emerson, Guduza System Technologies, Fleetmatics Group PLC, Telenav, Inc., TomTom International BV, and Trimble Inc.